I usually post on Sundays but in light of prepping for February, I’m posting today! As I get ready for February I think about what worked for January and what I want to change – which is the other beautiful thing about this system – tomorrow is a new day and an opportunity to experiment with something different that brings you closer to a system that works for you. So if you are new, or just setting up for the first time – try something, anything! Just, start. And then if it doesn’t work, you’ll start again the next day. Given that, here’s how I’m setting up my February. Monthly tasks – with a twist! I’m very happy with my monthly set up that I’ve had, so I’m running with that with some slight tweaks. First up are the Instagram challenges I’m popping into for February – if you need to get your prompts for #PlanWithMeChallenge or the NEW #RockYourHandwriting challenge, it’s not too late! On the left I wanted to track some of the errands I need to run and list of things I need to buy. This month I added a section called “My People.” I would describe myself as a Keeper, Gift Giver, and a Coordinator for my friend group (which is simultaneously excellent and annoying), which means tasks related to birthdays, gifts, catching up, or the endless stream of weddings all go here. We’ll give it a shot for this month! On the right I’ve evolved my Expense Tracker. I’m still doing this in paper because frankly, digital money isn’t really real to me (anyone else?! so… many… Etsy orders) – so if I have a visual way to track, I’m hoping it keeps me more conscious and aware of my spending habits. Mr. PPP and I have decided to track our shared finances via the amazing Mint App so I’m only tracking my own discretionary expenses, with a goal to keep it under a certain number. I derive this magic number after a looooong planning sesh – which you can read about here. Then I move on to my week, which is Monday through Friday. I prefer the weekly to the daily because I can see the whole, rather than in pieces. I’m really diggin’ this gradient thing lately! Depending on what is emphasized in this season of life, I change the sections that I feature in the weekly. This week, I have the weekly tasks for home and work, that awesome weekly tracker stamp from AtelierDreams on Etsy, blog/shop, my class I teach, check-in items with my student-worker, and things I’m waiting on. Within each day I still use signifiers – a checkbox for a task, arrow to migrate, X for cancellations, dot for a note, etc. I also added a double arrow (>>) if I delegated the task to someone else. The second half of my spread is the page for the weekend and my reflection page. Each week I want to pause to think about what’s going well, what were the sticking points – anything that I can use as feedback to feedforward into next week. Easy ways to reflect include highs and lows, wins and challenges, or things you want to stop, start, and keep doing. This month I’m trying an on-going “run sheet” as inspired by Dee Quine at Decade Thirty. She is simply SO CREATIVE and is always doing things in brand new ways. She created her own planner and added a flip out sheet that would lay side-by-side with her week. This sheet would capture “brain dumps” and then I can pull tasks from that sheet to the right week. This takes care of those random tasks I think of that probably won’t get done in this week, but need to happen at some point. I just attached a piece of cardstock to the back of my insert with washi-tape. I’m excited to see how this works out! There are SO many things I love about the Traveler’s Notebook system, but one of the drawbacks is that inserts can last you less time. You could add thicker notebooks but that adds weight, so it’s a cautious balance. I quickly ran out of room in my Collections insert, which left me rationing my remaining pages… which doesn’t make any sense! I wanted room to start planning our Boston trip and take notes for work, so I bought this beautiful stack of notebooks – a Rhodia dot grid notebook for my Collections to stay at home for occasional reference, and two smaller dot grid notebooks for notes at work. The amazing smaller notebooks are going to be for work. These are those little meeting notes, thoughts on curriculum, summer projects, ideas for training, and more that can go in these Baby Bullet Journals. 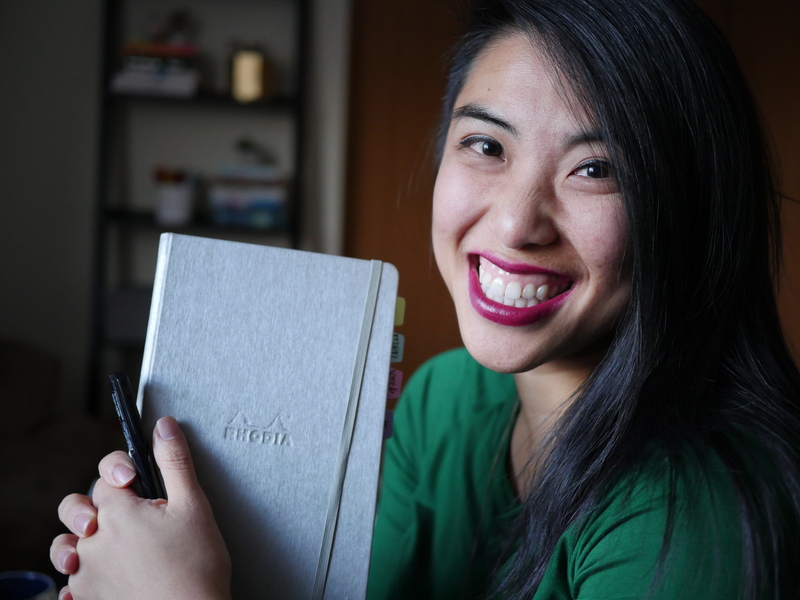 I’m setting these up soon so I can scope about how I use the bullet journal system as a teacher – stayed tuned on that! Interested in seeing how this has evolved? Check out my set ups from October, November, December, and January. OKAY WHEW – that was a lot. I hope you found it useful, or thought about a new idea for your own system. If you have questions, comments, suggestions, I’d love to hear them in the comments! This post features some affiliate links, which simply means if you end up buying something, I’ll get a small commission (at no extra cost to you!) that goes back to supporting my blog adventures. They’re the products I use and recommend – thank you in advance for your support! Are you ready to #RockYourHandwriting? I can’t see the replay video. Is it available somewhere else? I just did a review of one! It’s from RedCo and i really like it! For your weekly layout, how are you deciding where to place your tasks (the circles)? I see some that are higher up and some that are farther down. For example, Mon 1, you have “HH JC” higher up and then on Fri 5, you have “EYL Check in” starting farther down.